Last time I went through the results of the latest playtesting project, which showed (at least preliminarily) that the end-run strategy in Over the Next Dune is still both too strong and not very much fun to play. Although that’s regrettable, it’s not really surprising–the end run has been powerful and boring throughout the game’s history to date. Time to have another go at fixing it once and for all. Facts: As discussed in this post. 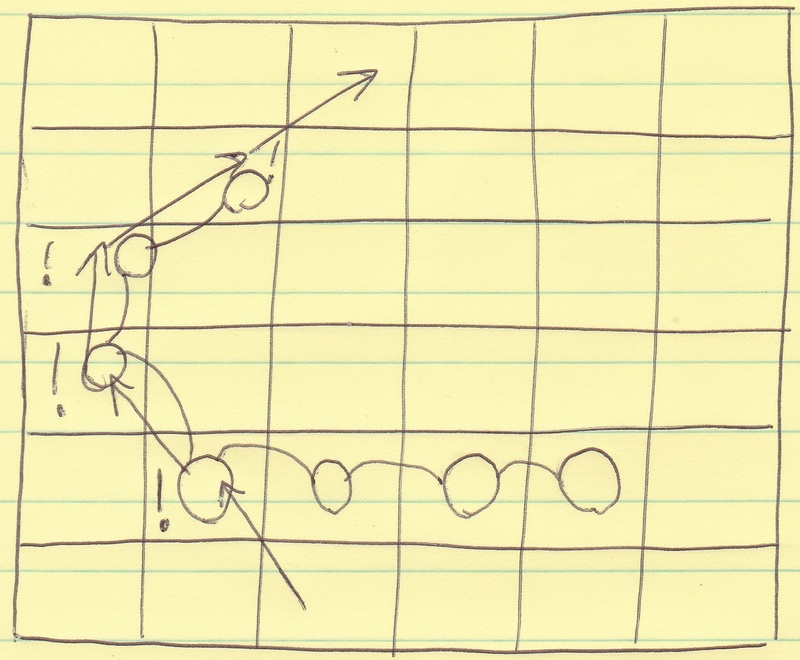 Issue: How can the end run be made both less effective and more interesting, without increasing the power of strategies that involve moving up the middle of the board? I’m pretty sure that this is a complete statement of the issue. Playtesting has revealed that going up the middle of the board is a strong approach that wins most of the time. If that strategy gets easier the game could become trivial. Whatever is done to fix the end run, it cannot have that sort of collateral damage. As regards the end run itself, there are really two things that need doing. It has to be made weaker as a way to win the game, and it has to be made more engaging. Right now the game is in the deeply regrettable position of having a dominant strategy which is boring to play. Fixing just the strategy’s dominance still leaves it boring, an ineffective and joyless trap for those who haven’t tried it before. Addressing the boring-ness without reducing the strategy’s power makes a game that’s fun but lacks replay value, worth playing only for so long as it takes to master the best approach. Both problems have to be dealt with. Rules: The rules for OtND’s design; the most important of them for this purpose is that the decisions players make must be interesting. A player who moves to the side with his or her first move gets to the second row, just like the player who goes straight ahead. 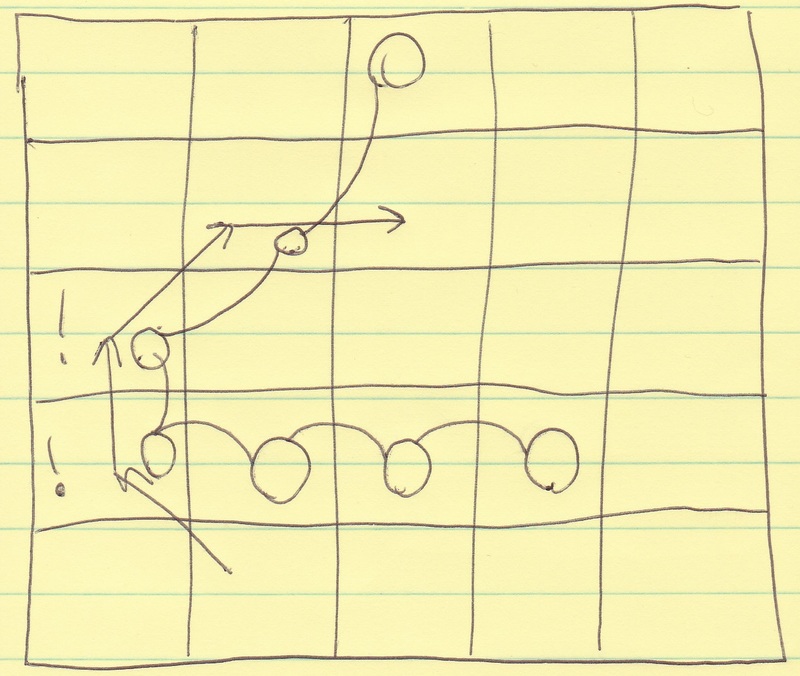 Since the board is a grid, and diagonal movement has the same “cost” as orthogonal movement, players can shift to the side without losing forward progress. As searchers tend to be found more often in the center of the board than at its edges, going sideways makes players safer. Thus, it’s natural to go sideways: in terms of winning and losing, it’s all upside. Players who move to the sides get safety and lose nothing. The player who moves straight ahead gets to the other end of the board in two moves; the player who sticks to the edge needs four. Changing the board to make the end run take a much longer amount of time could end its dominance as a strategy. Searchers will not trouble the player often, but even minor disruptions could cost the player too much time. It would become a risky play. I fiddled with that solution for a little while, but ultimately discarded it. Part of the trouble was that it made the rules for searcher “bouncing” a lot less intuitive. Right now just about everyone is comfortable with how searchers move once they see it in action; having lots of right angles makes it easy. 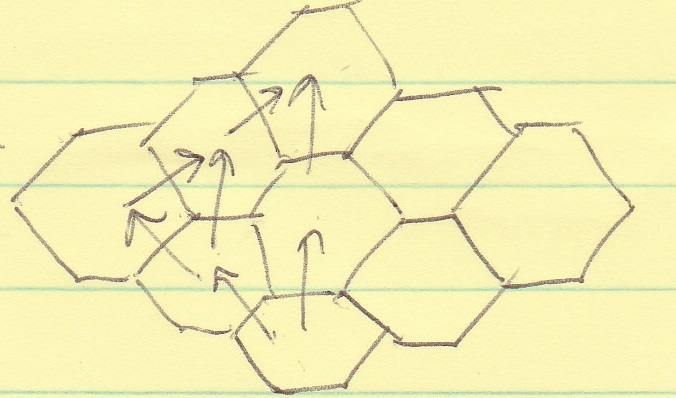 Hexagons, by contrast, turned out to need weird rules right from the get-go just to stop the searchers from continuously moving back and forth. The bigger issue, however, was that changing the length of the board edges did nothing to make the end run more interesting. Players at the edge would still rarely have to deal with a searcher; indeed, they would probably have to do so even less often than before! It would just take longer to do something boring, which might be fair but surely isn’t fun. It takes six moves to get off the board from the edge, but only five when moving through the giant space in the middle. Unfortunately, this concept also didn’t get off the ground. It threatened to strengthen moving up the middle, which is good enough (and possibly far too good) as-is. Furthermore, it didn’t make the edges that much more interesting. If the searchers also treat the giant spaces as a single space (which had its own rules strangeness) they’ll get to the edges a bit more often. That doesn’t add much. To get them to the edges frequently the giant spaces will have to appear in several places and/or be very large, which would make balancing the middle strategy a nightmare. Quite possibly, it would prove impossible to make both the end run and going up the middle interesting strategies. At this point I knew I didn’t want to mess with the board. It was hard, and it broke things. 😉 However, figuring out those possibilities brought home the centrality of the searchers to me. The searchers are the challenge in the game; they’re why players have to make difficult decisions; they are, in a very real sense, what makes the whole exercise count as a game. To make the end run harder, I needed to make it harder for players at the edges to deal with searchers. To make it more interesting, I needed to up the ante on those confrontations. My first thought was just to have lots more searchers. That would make it more likely that players at the edges would confront multiple searchers, a situation in which end-runners often fare poorly. However, it would also increase the game’s “overhead” dramatically, slowing play. Adding time between interesting decisions is regrettable at best. 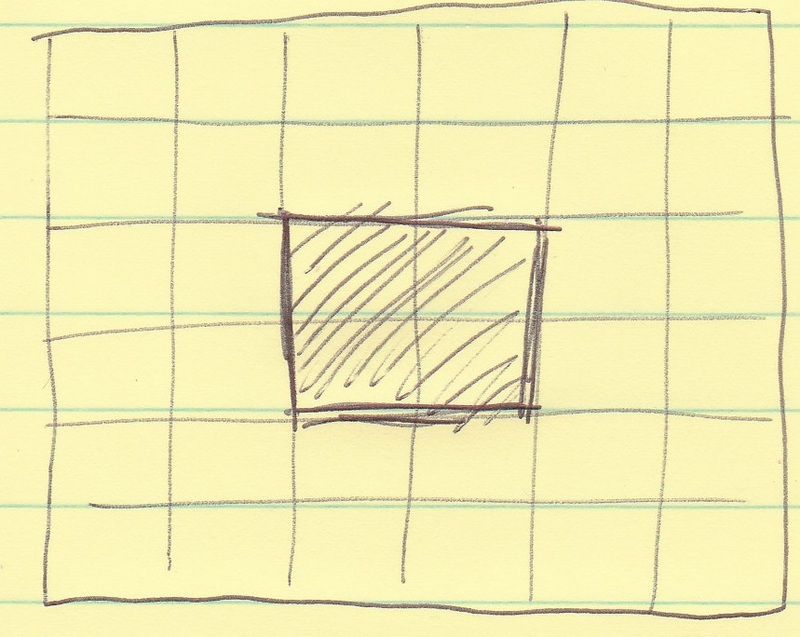 Another possibility was to have searchers appear on the sides of the board–to make the edge not really the edge, with a conceptual space beyond it from which searchers might appear. However, that basically amounted to “if you are at the edges you may randomly get caught.” That’s not interesting; it’s just unpredictable punishment. There’s no counterplay. The idea of more realistic searchers, though, put me on to something that I really liked. What if the searchers could follow the players’ trail when they’re at the edges? The searcher spots the player where the exclamation marks appear, and turns to follow. It would work like this: when the players move to the sides of the board, they enter special terrain in which they have to mark their paths. Searchers follow those paths, chasing after the players. (Conceptually, perhaps the edges have wet sand that retains tracks, or something else the searchers can use to follow the players’ movements.) They continue to follow until the players move out to a “trackless” space in the center of the board, at which point they resume moving normally. The searcher chases, but the player moves to a “trackless” space and the searcher keeps going in the wrong direction. I’m pretty sure that this solves both problems. It makes the end run weaker, because players who just go up the side of the board can now find themselves in a race with searchers who move faster than they do. It makes the end run more interesting, because players have to choose their paths carefully, knowing that they’re leaving trails that can be used against them later. Finally, it doesn’t make the up-the-middle strategy better. Whenever a player token leaves any space in columns 1-5 or 16-20, the player must mark the direction in which the token goes. Whenever a searcher covers one or more spaces which are marked in this way, it immediately turns to face the direction marked. (If the searcher has more than one direction to choose from, it chooses the direction in the space closest to the “top” of the board. 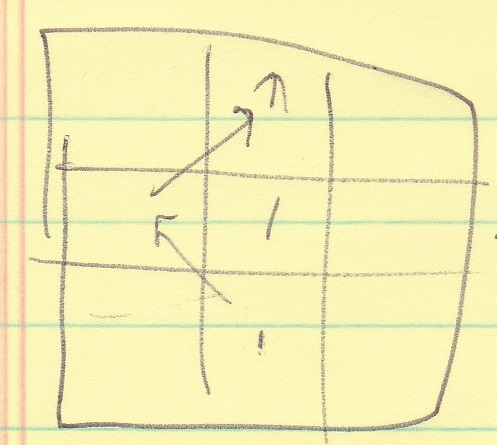 If multiple spaces with a direction marked in them are equally close to the “top” of the board, the searcher chooses the direction in the space closest to the center of the board among those options.) If the searcher has not yet finished moving, it continues moving in the new direction. If a player leaves a space which already has a direction marker, remove the old marker and replace it with a new one showing the direction in which the player’s token left the space. If you get a chance to try this out, let me know–I’m very interested to hear about how it works out for you.